This peak is #15 on the Height List for Washington . 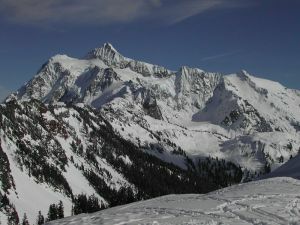 This peak is #13 in Prominence List for Washington .Mount Shuksan is a rugged, complicated, glaciated massif located east of Mount Baker. Mount Shuksan originated as ocean-floor basalt (Jurassic-era, 150M years ago), metamorphosed to greenschist in Cretaceaous (30M years later) and transported under the earth's mantle by tectonic forces to its present location. It contrasts with the surrounding volcanic peaks. Many routes of varying difficulty lead up the summit.